Rose gold is a gold and copper alloy widely used for its reddish colour. It is also known as pink gold and red gold. As it was popular in Russia at the beginning of the nineteenth century, it is also known as Russian gold, although this term has become somewhat rare. Although the names are often used interchangeably, the difference between red, rose, and pink gold is the copper content. The higher the copper content, the stronger the red coloration, as pure gold is yellow and pure copper is reddish. 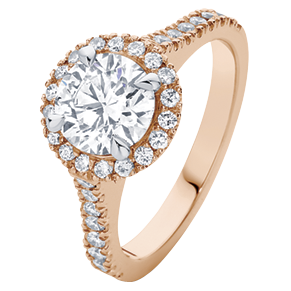 A common alloy for rose gold is 75% gold and 25% copper by mass (18 carat). Since rose gold is an alloy, there is therefore no such thing as “pure rose gold”.